Choosing an appropriate online service for your blog, that offers a centralized discussion platform to maintain a rich comment system complete with social integration is a matter that requires comprehensive information on various factors. You need to be sure that the comment system you are opting for your blog has advanced administration and moderation options along with extensive community functions. 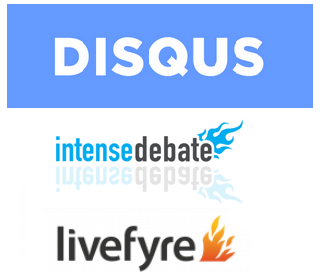 Most of the people will narrow down their choices to Disqus or Livefyre. In today's post, I will be discussing with you people, the different aspects and features of both these network community and comment system platforms including the administrative and moderation options to opt the best for your blog. To begin with, the comfort of making comments on both Livefyre and Disqus was tested out to scale the difference between the ease that both platform provide. 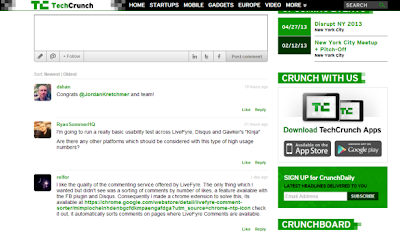 Firstly a comment on a post at Techcrunch,which uses Livefire comment system, was tested out and it revealed that this required an extra step of asking for email before the comment could be posted. This is shown below in figure 1.0. 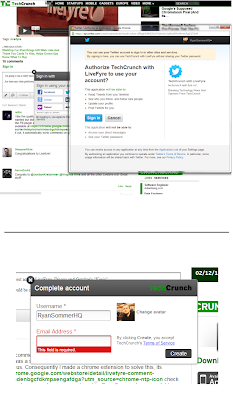 To run a check between the two comment systems, making comments on the Next Web where they have Disqus was found to be pretty much simple and straight forward as it required only a single step, a mere click on 'sign in with twitter' and you're done, as you can see from the figure 1.1 below. Although both Livefyre and Disqus are mobile/tablet compatible having a separate dashboard view of your recent comments and overall interactions, Livefire however make small delays in revealing the live comments on your activity stream. There has been considerable efforts over the years to bring down different kinds of internet spamming. 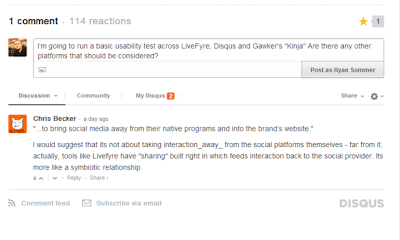 Livefyre and Disqus both require a social account or registered account through their platform in order to post a comment. This in return contributed significantly to reduce the spamming count. However this does not mean that spamming is eradicated completely. 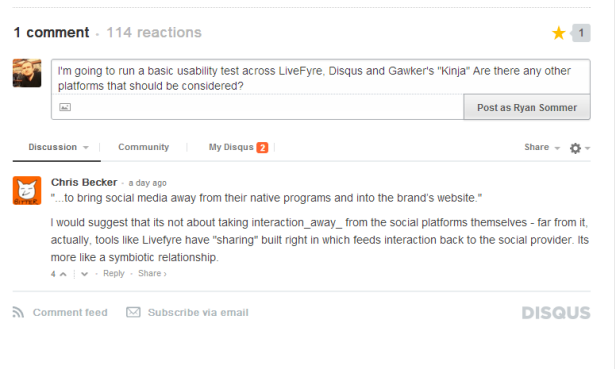 Both Livefyre and Disqus are still subject to a little bit of spamming issues where people who have least insight and knowledge about the topic make comments to leave a spam link at the end. This thing is being worked upon but they are having a hard time trying to filter these problems. We talk about advantages. Its inevitable that one of them will have an edge over the other in some aspect, but whats important is to scale these advantages according to your need. Livefyre gives you the blessing of comments popping up in real time unlike the WordPress commenting system, and lets you see a counter of how many people are actively reading the post at the time. Disqus on the other hand provide you with greater administrative abilities that include blacklisting people who often leave spam links on your site. Further more, on Disqus you can alternatively click on someone you follow and see all the comments they've made on other sites. 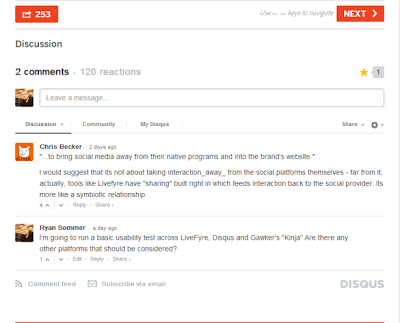 When talking about the presentation of both, Livefyre although provides you the facility to list the comments in order of newest/oldest, on the contrast Disqus automatically adjusts comments with oldest first but compensates for this by providing more features for the registered users. These extra features include the following. 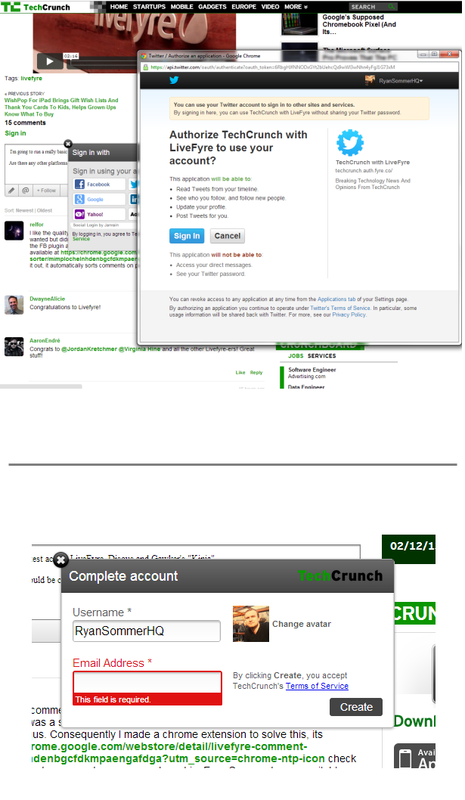 Reaction feed, which include the list of people who tweeted the URL of your post. Community, which reveals the most discussed posts of the website, including the top commentators. My Disqus, which brings you recent updates from Disqus users you follow on their platform. How to Add SCM Music Player to Blogger (Blogspot)? What are the Best WordPress Anti-Spam Plugins to Install?